My Mother often talks about her mother’s (my Gran) legendary cast iron frying pan or skillet. It was used almost daily and no one was ever allowed to wash it. It had built up a strong non-stick patina and was never exposed to water just wiped out after use. The wooden handle even fell off after a few years and my Uncle Bill repaired it using an old broom handle that was a bit too long! I don’t know what happened to that skillet I would love to own it now. I have recently become a convert to using cast iron for cooking in the kitchen. To begin with, I just couldn’t work out the best way to clean the pan, after use. I found the cooking residue was difficult to remove and on one occasion the pan even started to rust in storage!!! So, trying not to despair, I did some research on the web and bought a book. I experimented with a mixture of different cleaning techniques. Finally, I worked out the best way to clean and maintain my skillet. 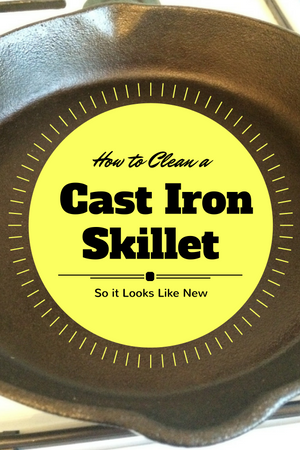 In this post, I’m am going to share my quick and easy method for cleaning a cast iron skillet. Cast iron cookware requires a different method of cleaning to other kitchen equipment. When cleaning it is best to avoid using detergents so that the skillet does not lose it’s seasoned layers and therefore it’s non-stick characteristics. 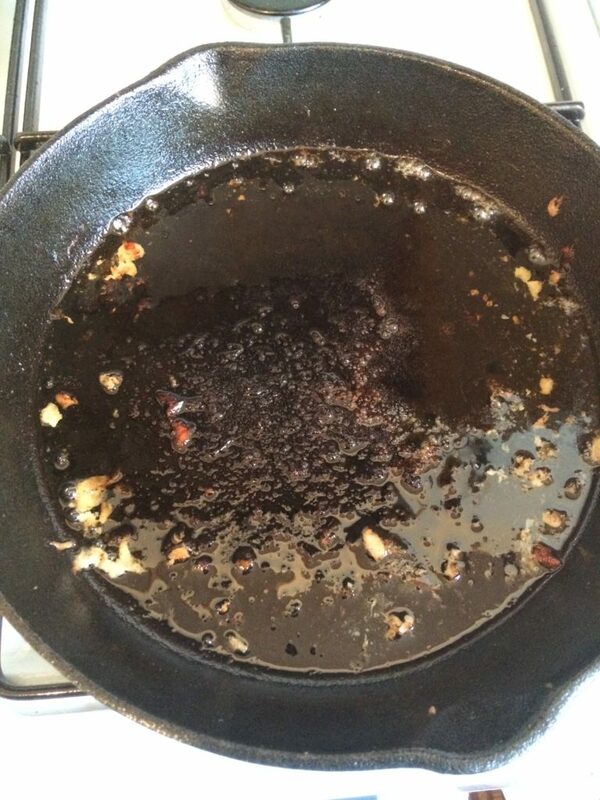 Don’t ever let water sit in the skillet as it will start to rust surprisingly quickly. 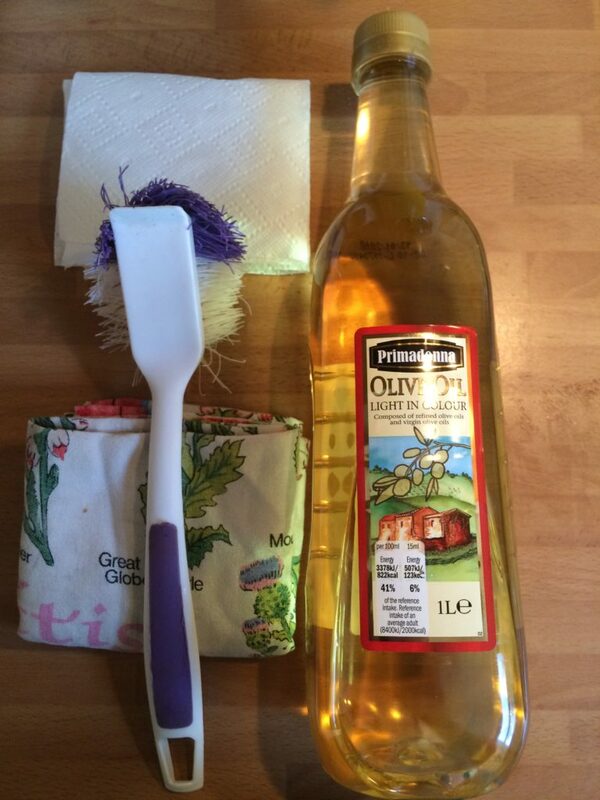 Before you start cleaning your skillet you will need kitchen paper towel, a washing up brush (I use one with nylon bristles but natural would work well), an old cotton tea towel and olive oil. 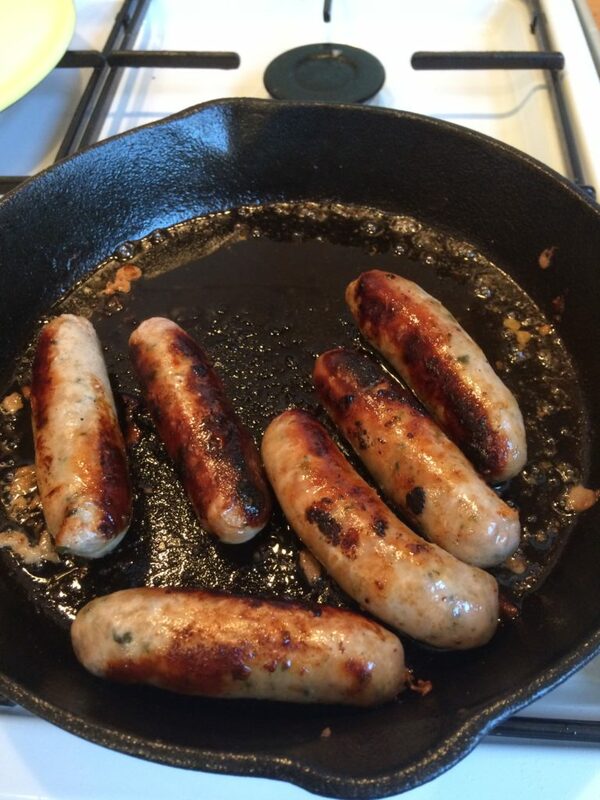 As you can see from the next two pictures I used my skillet to cook some sausages. This left the skillet rather dirty, messy and greasy! Pour away any excess fat while the skillet is still warm. Wipe away fat from the skillet using paper towel. Fill the skillet with water about ¼” to ½” place the skillet over heat. Once the water starts to simmer use the washing up brush in a circular motion to remove any residues from the bottom of the skillet. Pour this dirty water down the drain. Repeat again with some more clean water and if there is still residue then use the brush to remove this. I find 2 goes is usually sufficient. Once the skillet is free from any food residue stuck to the bottom rinse with clean water then place over the heat again until dry. You can use a cloth to help dry the pan off. Then put about a teaspoon of olive oil in the skillet and gently work it in with the cloth, while still over the heat. The final finish should look shiny and smooth, just like new. Once this shiny finish is achieved turn off the heat. 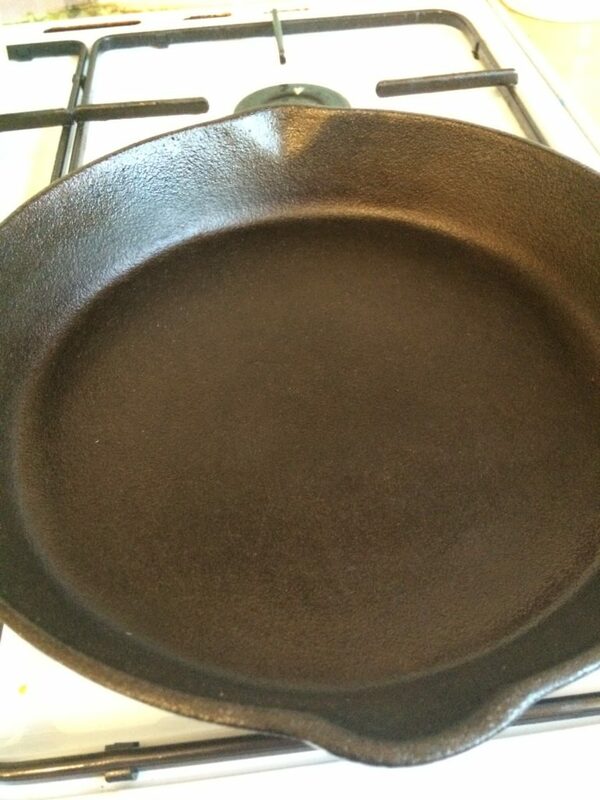 Here is a picture of my skillet after cleaning as you can see it looks like new. 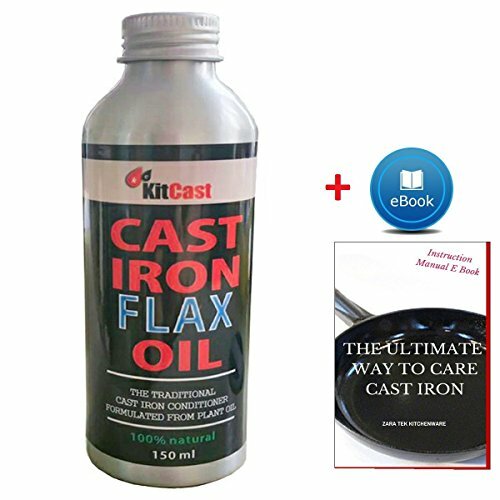 If you do ever find you have lost the non-stick finish or the cast iron has rusted, don’t despair, the pan can be revived using a process called seasoning. Use wire wool to remove the rust and then treat with flaxseed oil about a teaspoon rubbed well in. Then place the skillet in the oven upside down for 1 hour in a very hot oven (as hot as your oven will go!). Repeat if necessary. 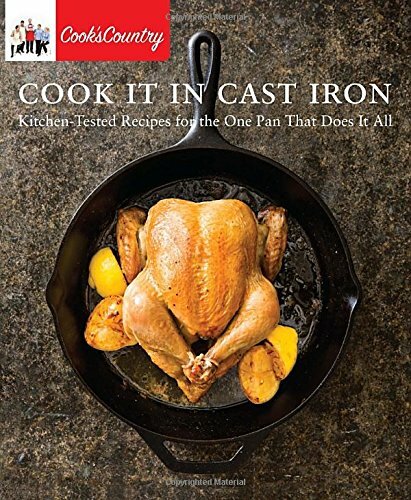 One other tip I kept coming across when researching, the best way to clean a cast iron skillet, was to use salt to rub off the food residues before, rinsing and oiling. I have never used this method but this was highly recommended by many people. You can see an example of how to use the salt method on “The Pioneer Woman” blog. 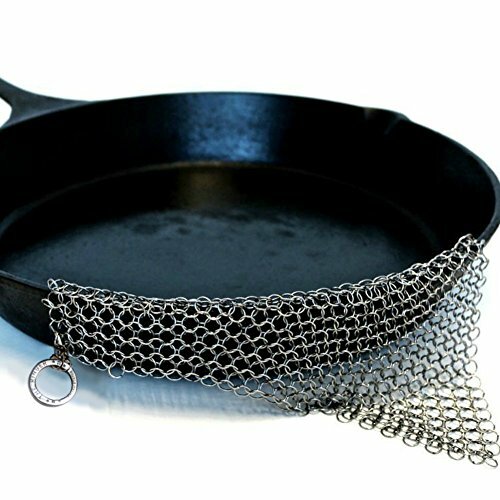 By cleaning and looking after your skillet this way it should last a lifetime and more!! In fact the more a cast iron skillet is used and cleaned the better it becomes.